The Waco CG-4 was the most widely used United States troop/cargo military glider of World War II. It was designated the CG-4 by the United States Army Air Forces, and named Hadrian in British military service. Designed by the Waco Aircraft Company, flight testing began in May 1942, and eventually more than 13,900 CG-4As were delivered. The wings are first covered with a canvas fabric stretched on like wallpaper over plywood then every seam, hold, open place, closed place, and edge is taped down with the all adhesive dope that not only makes the wings airtight, but covers my hands, my slacks, my eyebrows, my hair, and my tools with a fast-drying coat that peels off like nail polish or rubs off with a thinner that burns like Hell. The CG-4A could carry 13 troops and their equipment. Cargo loads could be a quarter ton truck (Jeep), a 75 mm howitzer, or a � ton trailer, loaded through the upward-hinged nose section. C-47s were usually used as tow aircraft. A few C-46 tugs were used during and after Operation Plunder. The USAAF CG-4A tow line was ⁄16-inch-diameter (17 mm) nylon, 350 feet (107 m) long. 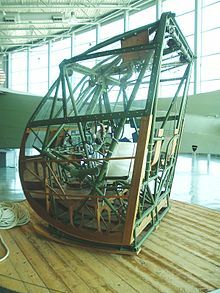 The CG-4A pickup line was /16 inch- (24 mm)-diameter nylon, but only 225 ft (69 m) long including the doubled loop. Sixteen companies were prime contractors for manufacturing the CG-4A. Among them were, Wicks Aircraft Company of Kansas City, Commonwealth Aircraft of Kansas City (1470), General Aircraft Corporation of Lowell (1112), Robertson Aircraft Corporation of St. Louis (170), Northwestern Aeronautical Corporation of Minneapolis (1510), Ford Motor Company of Detroit (2418 Units at $14,891 dollars each) and the WACO Company of Troy (999 Units at $19,367 each). Others were the Cessna Aircraft Company of Wichita, Kansas (750), Babcock Aircraft Company of Deland, Florida (60), Gibson Refrigerator of Greenville, Michigan (1078), Laister-Kauffman Corporation of St. Louis, Missouri (310), National (1 at an astronomical $1,741,809) , Pratt-Read of Eddystone, Pennsylvania (956), Ridgefield Manufacturing Company of Ridgeville, New Jersey (156), Timm Aircraft Company of Van Nuys, California (434), and Ward Furniture Company of Fort Smith, Arkansas (7). Airplane Picture - During Operation Market-Garden, the 101st Airborne Division was reinforced with twelve gliders on 18 September 1944. Here, Waco gliders are lined up on an English airfield in preparation for the next lift to Holland. Whiteman Air Force Base was originally activated on 6 August 1942 as Sedalia Glider Base. In November 1942 the installation became Sedalia Army Air Field and was assigned to the 12th Troop Carrier Command of the United States Army Air Forces. 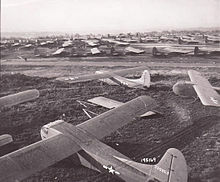 The field served as a training site for glider pilots and paratroopers. Assigned aircraft included the CG-4A glider, Curtiss C-46, and Douglas C-47 . However, the C-46 was not used as a glider tug in combat until Operation Plunder in March 1945. CG-4As went into operation in July 1943 during the Allied invasion of Sicily. They participated in the American airborne landings in Normandy on 6 June 1944, and in other important airborne operations in Europe and in the China-Burma-India Theater. Although not the intention of the Army Air Forces, gliders were generally considered expendable by high-ranking European theater officers and combat personnel and were abandoned or destroyed after landing. While equipment and methods for extracting flyable gliders were developed and delivered to Europe, half of that equipment was rendered unavailable by certain higher-ranked officers. Despite this lack of support for the recovery system, several gliders were recovered from Normandy and even more from Operation Market Garden in the Netherlands and Wesel, Germany. The CG-4A found favor where its small size was a benefit. The larger British Airspeed Horsa could carry more troopers (seating for 28 or a jeep or an anti-tank gun), and the British General Aircraft Hamilcar could carry a light tank, but the CG-4A could land in smaller spaces. In addition, by using a fairly simple net system, an in-flight C-47 equipped with a tail hook could "pick up" a CG-4A waiting on the ground. The system was used succsefully in the 1945 high-altitude rescue attempt of the survivors of the Gremlin Special in a mountain valley of New Guninea. The CG-4A was also used to send supplies to partisans in Yugoslavia. After World War II ended almost all the remaining CG-4s were declared surplus and almost all were sold. Many were bought for the wood in the large shipping boxes. Others were bought for conversion to towed camping homes with the wing and tail end cut off and being towed by the rear section and others sold for hunting cabins and lake side vacation cabins.